Here’s how you measure the height of the extruder head over the build platform to calibrate the Z-axis travel: a taper gauge. Home the Z stage, zero the readout, move the stage downward by known increments until it’s less than 4 mm above the platform, then slide a taper gauge under the nozzle until it touches. Read off the actual nozzle height above the platform, add that to the distance you moved the nozzle from its home position, and you have the total Z axis travel. For example, right now my TOM Z axis travel is 115.3 mm. Plug that into the homing routine in start.gcode and you’ve got perfect nozzle height control. Here’s a Starrett No. 270 taper gauge showing the nozzle 1.65 mm above the platform. One might quibble with the last digit, given the bit of snot hanging from the nozzle, but it’s pretty close. The gauge has inch divisions (0.001 in) on one side and metric (0.05 mm) on the other. I’ve put plenty of hours on the metric side in recent weeks. Fortunately, I’ve had that gauge in my tool cabinet forever; I’d be reluctant to cough up the C-note required to buy one these days. That Enco page gives some other choices, none of them, alas, inexpensive. If the link has rotted out, search for Starret No 270 taper gauge and you’ll get close. I think you could construct something similar by gluing or soldering layers of brass shim stock: 8-mil (call it 0.2 mm) shim stock would probably stack up in 0.25 mm increments under sufficient pressure. You could measure the resulting steps to get pretty good accuracy, even if they’re not regularly spaced. Perhaps a gauge that measured 1.00 to 3.00 mm in steps of 0.25 mm, stacking eight thin layers atop a sturdy 40-mil / 1 mm base strip? This entry was posted on 2011-02-14, 07:20 and is filed under Machine Shop. You can follow any responses to this entry through RSS 2.0. Both comments and pings are currently closed. How about sticking sheets of paper under there? You can calibrate the thickness of paper by measuring how thick a ream is, and dividing by the number of sheets in that ream… Kinda obvious, but I remember “Mr Wizzard” showing how to do that to measure the thickness of a human hair. I think he shimmed a mirror with paper until a line drawn on a piece of paper appeared in the same place as when a hair was under the mirror. Other possibilities: a homemade sine block using a steel ruler and a piece of drill rod; a leaf-style thickness gauge; or possibly one of the small keychain-style sparkplug gapping tools that includes a linearly increasing width gauge wrapped around the perimeter. Or for Ed’s purposes, take the z-height indicator off the Sherline and stick it on this for long enough to test the height. But the Starrett thickness gauge is sure an elegant solution. If the bottom surface is flush with the gauges, then that’s absolutely the way to go! Even if it has a flat bottom surface, you could measure the offset and add that to the gauge reading. I must beat my build platform notes into shape: I did something pretty much as you describe, except that it looks like a collision between a hatrack and a tower clock, to measure the build platform’s flatness and tilt. The extruder is exquisitely sensitive to height-above-average-terrain while making the first pass: too low and it tears up the build platform, too high and the filament doesn’t stick. Compressible measuring instruments are bad: they indicate more vertical travel than there really is! 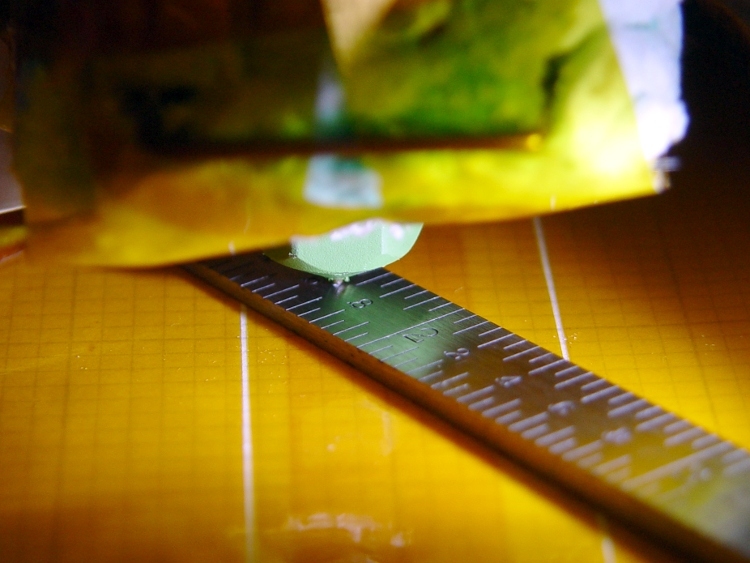 The tolerances are daunting, because the first pass occurs at half the layer thickness. I’ve been using a tall-and-sloppy 0.4 mm layer while fiddling with other things, so the first pass is at 0.2 mm: 8 mils off the surface. Folks who know what they’re doing run 0.2 mm layers, so the build platform must be flat to 0.1 mm = 4 mils across the surface. The official directions have you zeroing at the top of travel, disabling the motors, running the Z stage down by hand, then judging when the nozzle kisses the build platform. That’s tedious, produces terminally greasy fingers, and requires judging when that precious nozzle contacts the surface. Curious – since the Starret taper gauge is so expensive, it must be pretty useful… but why not use cheap automotive-style feeler gauges? Is the error stack up really that bad, maybe? I have no idea. Seems to me like the taper gauge might accidentally serve as a wedge, maybe (inadvertently) being better at setting a distance than measuring it. This would be a good opportunity for me to learn something, I suspect. why not use cheap automotive-style feeler gauges? Feeler gauges, at least the ones I have, are either wires with rather coarse steps or flat blades in an awkward pack that doesn’t lie flat. It’s surprisingly easy to get a good reading with the taper gauge: slide it under the nozzle until it touches. There’s an unmistakable stop at that point and the repeatability seems to be well under 0.05 mm. The picture hides the scale: 1 mm of height covers 31.5 mm horizontally. You’re not wedging the thing under the nozzle! I think the expense comes from the need to cut a precise taper over a considerable length. It’d be straightforward to build one with much-relaxed tolerances suitable for lining up a plastic extruder… you couldn’t extrude it, I think, but a milling machine and a sine bar should do the trick.